Navigator will give you, the consumer the ability to look for a product in a particular location in the store and route you there. 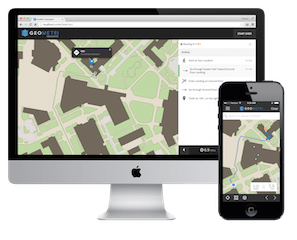 Asset tracking with indoor GPS allows people to track things, whether it be a Bluetooth beacon on a forklift or cleaner, or products, analyzing foot traffic and how people flow through buildings, and how to generate revenue. Atlanta airport is one of the busiest airports in the world. When people walk into a building their cellphones give off signals and Geometri can triangulate where they are located. They are interested in where the people are flowing. Geometri is used in three airports – Atlanta, MassPort, and Tampa. The average spend per passenger in the airport is $9. Atlanta has 95 million passengers a year and that’s close to $1 billion in spend. “So with our system alone, just being able to adjust, manage and predict bottlenecks allows them to actually increase revenue to their retailers and concessions,” concluded Healander. Originally the software was built for retailers, and now is used in airports, fleet management and traffic shows as well. In Atlanta, through a partnership with Apple to provide an app, Geometri has a geofence around the airport. It has indoor GPS for the building. This entry was posted on Friday, September 4th, 2015 at 1:45 pm. You can follow any responses to this entry through the RSS 2.0 feed. You can leave a response, or trackback from your own site.